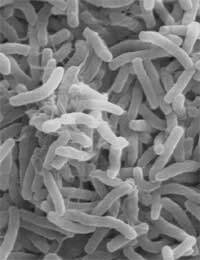 Home > Bacteria & the Gut > What is Cholera? Cholera is a severe infection of the digestive system caused by the bacterium Vibrio cholerae, which passes from person to person in contaminated drinking water. This gram-negative comma shaped bacterium causes excessive diarrhoea through the effects of a toxin. Cholera toxin inserts itself into the membrane of the cells that line the small intestine and acts as a powerful molecular water pump that pumps water from inside the body into the lumen of the intestine. The massive efflux of water causes the very watery diarrhoea that literally explodes from the body. The bacterial infection that causes cholera is not itself very dangerous – if the symptoms of cholera are managed, the infection is cleared by the body within a few days. However, as with many diarrhoeal diseases, the main problem is dehydration. Someone with cholera can become dehydrated within an hour of his or her diarrhoea starting, which gives some idea how severe it is. They can go into shock within three hours and be dead within 12 hours. Adults can be this badly affected by cholera but the impact on the elderly, the very young and people who are already weak because of another illness, is devastating. In all cases of cholera, it is important to start replacing the lost fluids as soon as possible using oral dehydration therapy, either as drinks made up from the sachets or, in very severe cases, a drip. Oral rehydration therapy is now commonly used and has saved many lives in the developing world. Cholera is not a modern disease. We are currently in the grip of the seventh cholera pandemic – the first one began in 1816. The disease has since claimed millions of lives. The first cholera pandemic took place from 1816 until 1826 and spread from Bengal, through India and into China. The second began only three years later but this was the first to reach Europe. It struck London and Paris in 1832, killing over 6000 people in London alone. Over 100 000 people died in France. This epidemic also reached the USA and Canada in 1834. The third cholera pandemic spread through Russia, Europe and North America between 1852 and 1860. It was during this outbreak that John Snow documented the illness in Soho. He noted that this epidemic in London was stopped after the removal of the the handle of a particular water pump and concluded that it had been dispensing infected water. During the fourth pandemic, between 1863 and 1875, people accepted that cholera was indeed transmitted by infected water and started to improve sanitation. This action soon started to reduce the frequency of cholera outbreaks in London. The fifth cholera pandemic ran from 1881 to 1896 and, apart from an outbreak in Germany, had little impact on Europe because of widespread improvements in sanitation and water supplies. Neither did the sixth pandemic, which lasted between 1899 and 1923, but it was very severe in Russia and the old Ottoman Empire. The seventh cholera pandemic began in 1961 and has lasted until the present day. It has been particularly bad in the developing world, in Bangladesh, North Africa, South America and southern Africa. In November 2008, an outbreak in Zimbabwe was causing concern. The epidemic illed 425 people and infected 11 000 others in that month. There is a vaccine for cholera, which is taken by mouth, but this is generally available only to travellers who go into regions where cholera is prevalent. In developing countries, improvements in drinking water supplies would make the most difference but economic difficulties, natural disasters and human conflict all continue to disrupt the efforts that could bring this about.